The process begins with an introductory meeting between you and the designer, during which you discuss various aspects of the wedding, as well as your aspirations and visions for the dress. This is an integral part of the process, as it allows the designer to gain insights about your needs and sense of style. The information collected during this meeting is later used to create the sketches, which aim to capture the true reflection of your ideal dress. You are encouraged to bring anything to this meeting which best represents your personal style. This may include items of sentimental value, favorite pieces from your own closet, pictures of gowns, flowers, cakes, images of wedding venues, or anything else that can serve as an inspiration to the designer. During the second meeting you are presented with a number of potential dress designs, exclusively tailored to your style and personality. At this time you will compare and discuss the various fabrics and finishes and make a decision that best suits your preferences and budget. 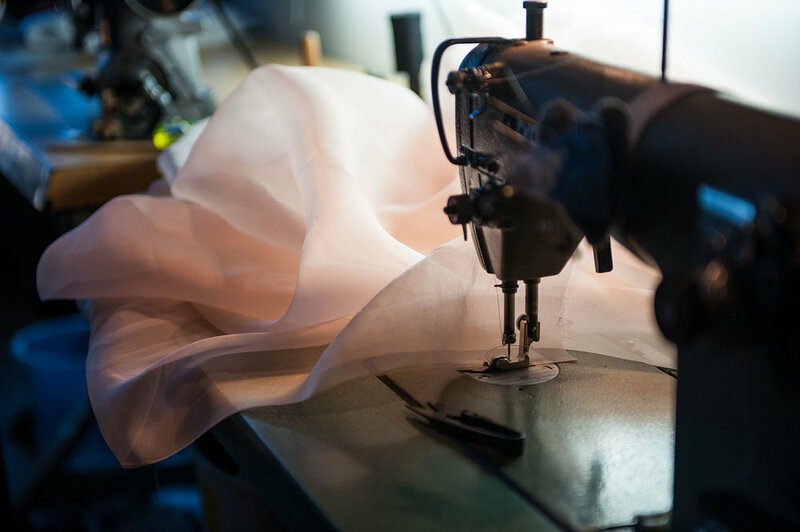 At this point in the process, you have already picked your favorite design, measurements have been taken, and the making of the dress has begun. In order to ensure that the sketch truly represents what you envision as your ideal dress, the designer makes a “first drape" out of recyclable fabric. 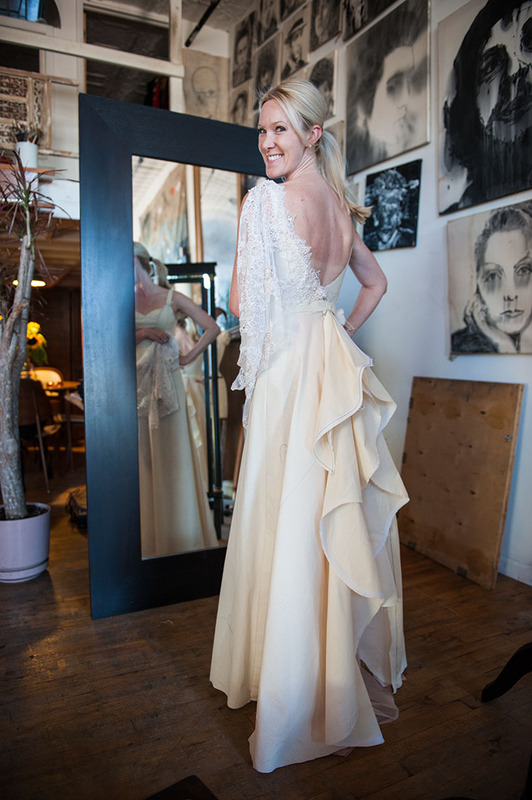 During the “First Fitting” you have an opportunity to try on the drape and determine if any changes need to be made before the real fabric is cut out. This avoids costly and time-consuming alterations later in the process. At the end of the “First Fitting” the dress design is finalized and the fabric for the actual garment is selected. The gown is draped in real fabric and fitted. Final corrections are made. This is a “dress rehearsal”, so to speak, and a celebration of the finished product. You are able to see your complete look before the big day. You can come in full hair and makeup, or our company can hire a makeup artist and/or hairdresser who can work with you on finalizing your look. Since this is meant to be a festive event, you can invite friends and family to share this memorable experience. Our team serves cocktails and we all celebrate the end of the journey, in which your dream bridal dress becomes a reality. Our prices vary based on each individual project. There is no set minimum for creating a custom bridal piece, as each one is very different and special. During the first consultation the designer works with you directly, going over your specific needs and the budget you have in mind. After the idea is confirmed we present you with different options of execution that are possible within your price range. Our gowns range from $3,000-$9,000, with the average falling between $3,500-$6,000. Our NK separates range from $1,300-$5,500 for a full look. We strongly encourage brides to contact us by email or to schedule an in person consultation at our studio in order to discuss pricing.